A Unique Concept: The Revolutionary Fusion of Toys & Video Games! 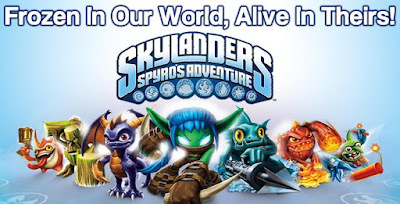 Join the battle to save Skylands and embark on a fantastical journey into the mysterious, mythical world, battle menacing outlandish creatures, collect treasures, and solve puzzles while on a quest to save their world from evil. Bring your characters to life in a boldly innovative adventure game where children can collect real-world toys and teleport them directly into the game using a mystical Portal of Power. Play with or against your friends on quests throughout Skylands and in the player vs. player battle arenas. Challenge yourself with lots of different fun mini-games. Choose A Skylander > Place On The Portal Of Power > Bring To Life In The Video Game! The Skylanders are so powerful that they remember their in-game experiences and upgrades as they explore the mysterious world of Skylands, battle menacing creatures and collect treasures. It doesn't matter what gaming system your friends have at their house, the Skylanders work on and across all major video game systems*. You can take your Skylanders over to your friend's house, drop them on their Portal of Power and your Skylanders will come to life in the game! * Skylanders Interaction figures and Adventure Packs work across the following consoles: PlayStation 3, Xbox 360, Nintendo Wii, Nintendo 3DS and PC / MAC.